Kimtech Kimwipes Delicate Task Wipes, by Kimberly Clark, are an obvious choice when your work requires delicate, light-duty wipers to handle precise tasks. With a legacy of more than 60 years of being the go-to wipe for cleaning surfaces, parts, instruments in labs, laboratory lenses, and medical offices, these wipes easily clean liquids, dust and small particles. Plus, the anti-static dispensing design reduces electrostatic discharge. As a business owner, these wipes are an efficient choice, thanks to the waste-reducing, one-at-a-time dispensing in the Pop-Up Box. Towel/Wipe Type: Dry Wipes; Application: Laboratory; Applicable Material: Glass; Metal; Plastic; Stainless Steel; Wood; Material(s): Tissue. 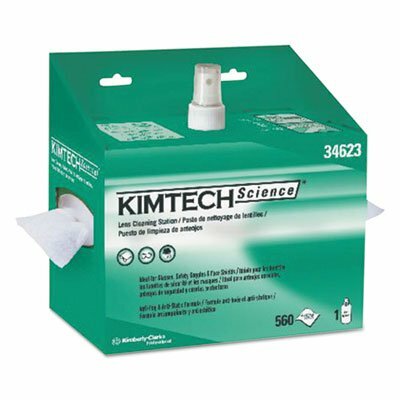 Kimtech KIMWIPES Science Lens Cleaning Station is a one-stop spot for lens cleaning. It’s a disposable, self-contained system, ideal anywhere glasses or safety lenses are worn. It includes a spray bottle of anti-fog, antistatic, silicone-free cleaning solution to remove dirt quickly and easily. It also features a POP-UP box of soft wipes, which won't scratch delicate surfaces when used wet. It’s your must-have solution for lens cleaning. Application: Lenses; Applicable Material: Glass; Material(s): Tissue; Number of Plies: 1. 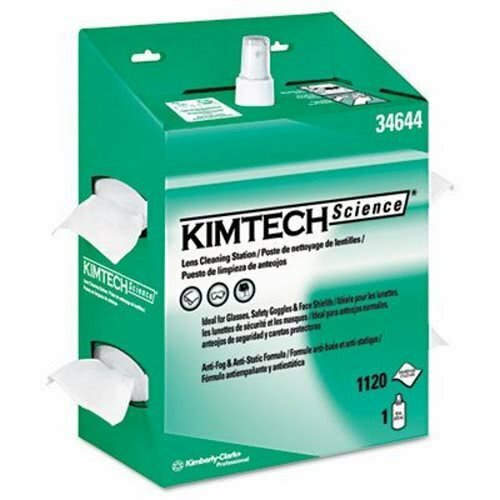 Kimtech KIMWIPES Science Lens Cleaning Station is a one-stop spot for lens cleaning. It’s a disposable, self-contained system, ideal anywhere glasses or safety lenses are worn. It includes a spray bottle of anti-fog, antistatic, silicone-free cleaning solution to remove dirt quickly and easily. It also features a POP-UP box of soft wipes, which won't scratch delicate surfaces when used wet. It’s your must-have solution for lens cleaning. Towel/Wipe Type: Dry Wipes; Application: Lenses; Applicable Material: Glass; Material(s): Tissue. 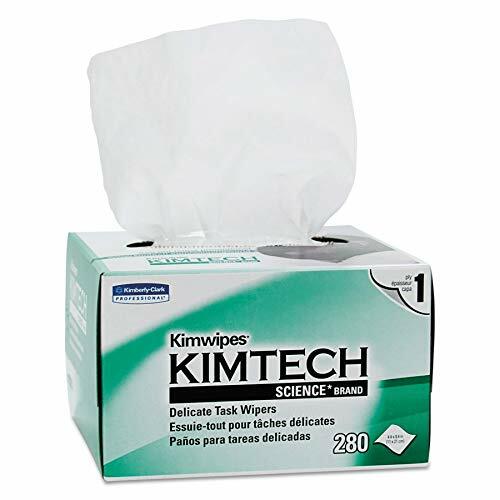 KIMBERLY-CLARK PROFESSIONAL* KIMTECH SCIENCE KIMWIPES Lens Cleaning, POP-UP Box - Includes four kits containing 1120 wipers and one 16-oz bottle of cleaning solution. A disposable, self-contained system, ideal anywhere glasses or safety lenses are worn. Contains an anti-fog, antistatic, silicone-free cleaning solution to remove dirt quickly and easily. Wipes won't scratch delicate surfaces when used wet. Each station includes 560 wipes and one 8 oz bottle of cleaning solution. Towel/Wipe Type: Dry Wipes; Application: Lenses; Applicable Material: Glass; Material(s): Tissue. Antistatic, antifog and silicone-free cleaning solution quickly and easily removes dirt. Each station includes a 16-oz. bottle of cleaning solution and lens-cleaning wipes. White. 4.5 x 8.5 lens-cleaning wipes. 1,120 per station. 4 lens-cleaning stations per case. Want more Kimtech Science Kimwipes Lens similar ideas? Try to explore these searches: Low Voltage Chandelier Frame, Ultra Compact 2 Way, and Pondmaster Fountain Kit.